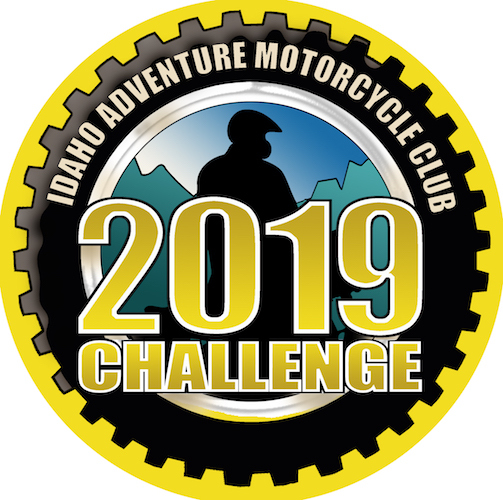 2019 Marks the tenth year of the IAMC Challenge, and we invite you to get out there this year to see some new sights, visit some old favorite spots, push your limits a little and (most of all) get to better know the great state of Idaho. The 45 sites for 2019 include some favorites from years past and a few new ones. A GPX file listing the Challenge Sites as waypoints for your GPS is available in the Route Library. Many thanks to Chuck Scheer for our bandanas and Challenge logo stickers for this and the past several years. Bronze Tire Winners will document visits to any 10-19 of the sites. They will receive a special edition “Bronze Tire” sticker and they will also be entered in a drawing to win a bronze-level prize at the conclusion of the challenge. Silver Tire Winners will document visits to any 20-29 of the sites. 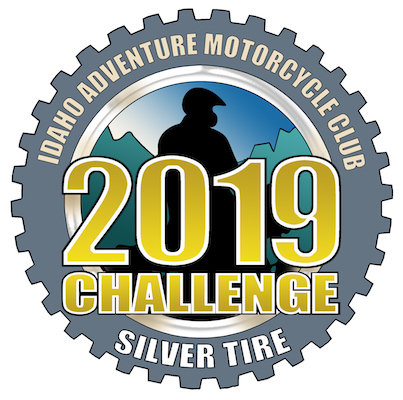 They will receive a special edition “Silver Tire” sticker and they will also be entered in a drawing to win a silver-level prize at the conclusion of the challenge. Gold Tire Winners will document visits to any 30-39 of the sites. They will receive a special edition “Gold Tire” sticker and they will also be entered in a drawing to win a gold-level prize at the conclusion of the challenge. Platinum Tire Winners will document visits at least 40-45 sites. They will receive a very exclusive “Platinum Tire” sticker and they will be entered in a drawing to win a platinum-level prize at the conclusion of the challenge. Of course adventure itself is the main reward, but other rewards await our challengers as well. Your entry fee of $20.00 entitles you to a bandana as well as an entry for drawing of prizes at the annual club meeting. The contest will run from April 1, to December 31, 2019. The prize drawings will be held at the annual club meeting, typically held in January of the following year (2020). Prizes will be awarded at this event. Specifics regarding this Award Ceremony will be released closer to the date of the ceremony. All challengers must be 18 years of age or older, or obtain written consent from their legal guardian. All challengers must be active members of IAMC. Officers and families of officers (if they are members) are not excluded from competing. Participation in the IAMC Challenge implies your agreement with our club’s nine terms and conditions. If you are already signed up for the Challenge click here to see list of sites. For existing members, the links to the Signup page above and in the menu on the left may not work correctly. If you are having this problem, you can click on the "My account" link in the menu on the left. In the Account page, there will be a tab labeled "Membership". Click on that tab and the next page will have a table at the bottom. In that table there will be links to "Extend" the membership. These links will allow you to renew your signup.